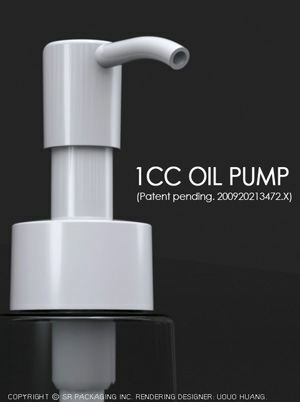 SR Packaging introduces a new oil pump, a solution to yesterday’s dispensing problems. It features a precisely controlled dosage of 1cc, and a patent-pending suction mechanism. One of the advantages of using the suction mechanism is that oil residue does not drip from the nozzle after usage, leaving the packaging clean. Another advantage is that due to the oil being sucked 2mm back from the opening of the nozzle, there is less possibility of contamination polluting the product inside the packaging. The current neck finish is 24/410 and output is 1CC+/-10%. Thanks to the glossy finish of the screw cap, there are more decoration possibilities for the customer to choose from including silkscreening, hot stamping and lacquering.